Introduction Respiratory pathogens associated with childhood pneumonia are often detected in the upper respiratory tract of healthy children, making their contribution to pneumonia difficult to determine. We aimed to determine the contribution of common pathogens to pneumonia adjusting for rates of asymptomatic detection to inform future diagnosis, treatment and preventive strategies. Methods A case–control study was conducted among children <18 years in Perth, Western Australia. Cases were children hospitalised with radiologically confirmed pneumonia; controls were healthy children identified from outpatient and local immunisation clinics. Nasopharyngeal swabs were collected and tested for 14 respiratory viruses and 6 bacterial species by Polymerase chain reaction (PCR). For each pathogen, adjusted odds ratio (aOR; 95% CI) was calculated using multivariate logistic regression and population-attributable fraction (95% CI) for pneumonia was estimated. Results From May 2015 to October 2017, 230 cases and 230 controls were enrolled. At least one respiratory virus was identified in 57% of cases and 29% of controls (aOR: 4.7; 95% CI: 2.8 to 7.8). At least one bacterial species was detected in 72% of cases and 80% of controls (aOR: 0.7; 95% CI: 0.4 to 1.2). Respiratory syncytial virus (RSV) detection was most strongly associated with pneumonia (aOR: 58.4; 95% CI: 15.6 to 217.5). Mycoplasma pneumoniae was the only bacteria associated with pneumonia (aOR: 14.5; 95% CI: 2.2 to 94.8). We estimated that RSV, human metapneumovirus (HMPV), influenza, adenovirus and Mycoplasma pneumoniae were responsible for 20.2% (95% CI: 14.6 to 25.5), 9.8% (5.6% to 13.7%), 6.2% (2.5% to 9.7%), 4% (1.1% to 7.1%) and 7.2% (3.5% to 10.8%) of hospitalisations for childhood pneumonia, respectively. Conclusions Respiratory viruses, particularly RSV and HMPV, are major contributors to pneumonia in Australian children. How much do respiratory viruses and bacteria contribute to community-acquired pneumonia in highly vaccinated children? Many pneumonia-causing pathogens are also detected in asymptomatic children, thereby confounding our understanding to their contribution to pneumonia in children. We conducted the largest age-frequency matched case–control study in a developed setting showing substantial contribution of respiratory syncytial virus, human metapneumovirus and Mycoplasma pneumoniae to all childhood pneumonia requiring hospitalisation in the post pneumococcal conjugate vaccine era. To date, few pneumonia aetiology studies from high-income settings seeking to quantify the exact contribution of pathogens to pneumonia have included healthy controls.9 11 Well-controlled epidemiological studies have reported the contribution of respiratory viruses to childhood pneumonia in developing settings, but their findings are unlikely to be generalisable to settings with better developed health infrastructure, including better vaccine coverage.15 19 20 We conducted a prospective case–control study to estimate the contribution of respiratory viruses and bacteria to childhood pneumonia in West Australian (WA) children, a highly vaccinated and high-income population. A diagnosis of CAP required: (1) the presence of acute respiratory symptoms (with or without fever) and (2) evidence of infiltrates or consolidation on chest X-ray.24 A pragmatic definition of radiologically confirmed pneumonia (infiltrates or alveolar consolidation as determined by the treating clinician) facilitating recruitment after hours (ie, when a radiologist is not available to review the chest X-ray). An equal number of contemporaneous healthy controls attending hospital outpatient orthopaedics or allergy clinics or a large urban community immunisation clinic were enrolled. Children attending clinic with respiratory symptoms, following recent respiratory illnesses or those previously enrolled as a case or control were not eligible. Controls were enrolled concurrently with cases throughout the study period, with the target enrolment in each of four age groups (≤1 year, 1–5 years, 6–9 years and≥10 years) frequency-matched to the number of cases enrolled in the preceding 2 weeks. The sample size calculation for the study has been previously described.21 A structured questionnaire was administered to parents/guardians to capture demography, relevant comorbidities including immunodeficiency, immunocompromised condition, congenital chromosomal abnormality, chronic respiratory, neuromuscular, neurological and cardiac disease and solid organ transplantation. The crude odds ratio (OR) of exposure was calculated to assess the relative frequency of detection of each respiratory pathogen among cases and controls. Multivariate logistic regression was used to calculate the adjusted OR (aOR) of detection of each pathogen for cases versus controls, adjusting for underlying demographic differences, recent exposure to antibiotics and for the presence of other pathogens. The aOR for each pathogen was then used to estimate the population-attributable fraction (PAF).26 Analyses were performed using STATA software, V.13.0, and figures were produced using GraphPad Prism, Version 5.0 (GraphPad Software, California, USA). Written informed consent was obtained from parents/legal guardians of all study participants. Assent was obtained from participants ≥7 years old. We enrolled 230 children with pneumonia and 230 controls. Of 230 cases, 24 (10%) cases were diagnosed with a parapneumonic effusion with 21 (9%) parapneumonia effusions drained. All drained effusions had microscopic purulence consistent with empyema. Cases were hospitalised for a median of 2 days (IQR: 1–3); no deaths were observed. Compared with controls, a higher proportion of cases were Aboriginal, born premature and reported a smoker in the household (p<0.001 for each) (table 1). The proportion of respondents <5 years attending day care was 59.1% among cases (n=87) and 36.6% among controls (n=66), and the median days of attendance per week for cases was 3 days (IQR: 2–4) and for controls was 2 days (IQR: 2–3). A higher proportion of cases had comorbidities compared with controls (14.7% vs 4.3%, p<0.001). More cases than controls had antibiotics in the 7 days prior enrolment (47.3% vs 2.1%, p<0.001). The proportion of cases and controls who had received at least two doses of PCV was 91.3% and 87.8%, respectively, and 10.4% of both cases and controls had received influenza vaccine in the preceding influenza season. Of 230 cases and 230 controls, one or more respiratory viruses were identified in 56.5% and 28.6%, respectively (OR: 3.2; 95% CI: 2.1 to 4.7), and at least one bacterial species was detected in 71.7% and 79.5%, respectively (OR: 0.6; 95% CI: 0.4 to 1.0). The distribution of respiratory viruses and bacteria among cases and controls is summarised in table 2. Detection of both viruses and bacteria was observed in 104 cases (45.2%) and in 56 controls (24.3%). Cases were more likely than controls to have multiple (two or more) viruses detected (OR: 5.1, 95% CI: 1.7 to 15.1) but not multiple bacterial species (OR: 1.0, 95% CI: 0.7 to 1.4). The multivariate logistic regression showed that after adjusting for demographic differences, antibiotic exposure in the preceding 7 days, and presence of other pathogens, RSV, HMPV, influenza virus and adenovirus were detected significantly more often among cases than controls with aOR 58.4 (95% CI: 15.6 to 217.5), 37.2 (95% CI: 7.8 to 177.7), 10.1 (95% CI: 1.8 to 57.1) and 12.1 (95% CI: 1.4 to 104.4), respectively (table 2). None of the influenza-positive cases (n=16) or controls (n=3) had received influenza vaccine during the preceding influenza season. RV speciation was available for 57 (69%) of 83 positive samples (26 cases; 31 controls). RV-A was detected in 13 cases (50%) and 15 controls (48.3%), RV-B in 1 (3.8%) case and 2 (6.4%) controls and RV-C was detected in 12 (46.1%) cases and 14 (45.1%) controls. Respiratory viruses were detected more commonly among children <5 years compared with other age groups (figure 1). More than 75% of cases positive for RSV, HPIV, HMPV and adenovirus were aged less than 3 years. 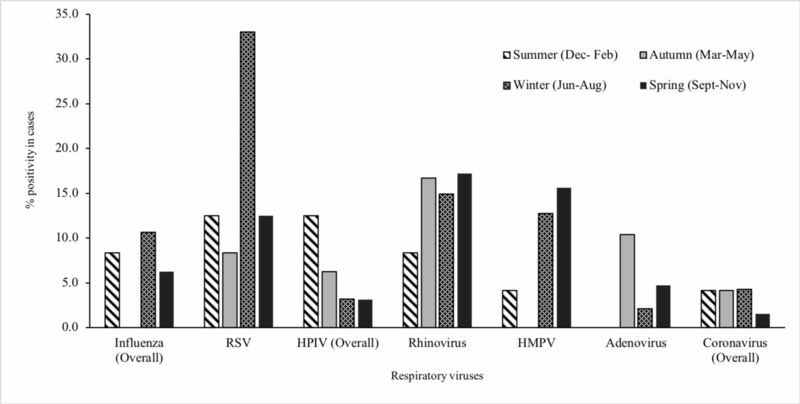 Respiratory viruses were detected throughout the year with frequent detection during the Australian winter months (June to August). 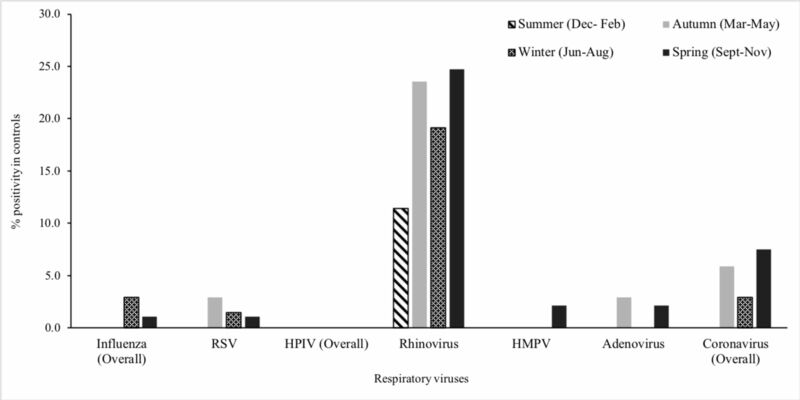 RV was detected throughout the year, while RSV, influenza and HMPV were mostly detected between May and November and HPIV between December and April; virus distribution among cases and control children was similar along the year calendar (figures 2 and 3). Distribution of respiratory pathogens by participant’s age (in months); dot lines refers to age-group breakdown among study participants; for bacteria,such as Haemophilus influenzae (Hi), Streptococcus pneumoniae (Sp), Moraxella catarrhalis (Mc) and Staphylococcus aureus (Sau), only children without prior antibiotic exposure were included and Mycoplasma pneumoniae (Mp) included all children. Distribution of respiratory viruses in the nasopharynx of children with community-acquired pneumonia (case group), by seasons, Perth, Western Australia, May 2015–October 2017. HMPV, human metapneumovirus; HPIV, human parainfluenza virus; RSV, respiratory syncytial virus. Distribution of respiratory viruses in the nasopharynx of healthy children (control group), by seasons, Perth, Western Australia, May 2015–October 2017. HMPV, human metapneumovirus; HPIV, human parainfluenza virus; RSV, respiratory syncytial virus. 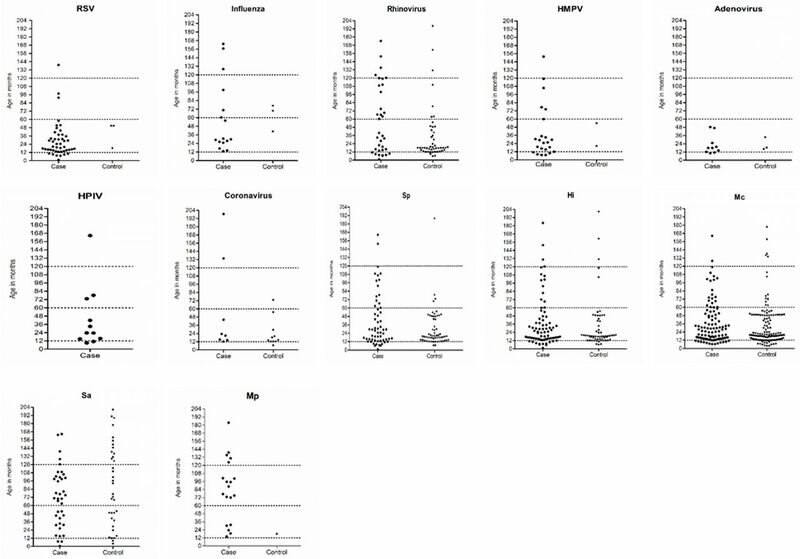 The multivariate logistic regression showed M. pneumoniae were detected significantly more often among cases than controls with aOR 14.5 (95% CI: 2.2 to 94.8). The frequency of detection of other bacteria was similar among cases and controls (table 2). Nineteen (32.1%) of 59 cases with S. pneumoniae detected had prior antibiotic exposure compared with 1 (1.6%) of 61 controls; for H. influenzae, the proportion was 45.3% (34/75) in cases and 3.2% (2/61) in controls; for M. catarrhalis, 29.1% (30/103) in cases and 2.0% (3/144) in controls; for S. aureus, 36.8% (14/38) in cases and 0% (0/36) in controls and for M. pneumoniae, 89.4% (17/19) in cases and 0% (0/1) in controls. Given the potential for antibiotics to influence the detection of bacterial pathogens, the analysis was repeated including only those with no prior antibiotic exposure: apart from M. pneumoniae (aOR 16.7; 95% CI: 1.6 to 164.8), no significant difference in S. pneumoniae (aOR 0.6; 95% CI: 0.2 to 1.3), H. influenzae (aOR 0.9; 95% CI: 0.4 to 1.8), M. catarrhalis (aOR 0.7; 95% CI: 0.4 to 1.4) and S. aureus (aOR 1.5; 95% CI: 0.7 to 3.5) detection was noted. Among children with no prior antibiotic exposure, few differences were noted in the age-group distribution of bacterial detection (figure 1). Among infants (aged <1 year), more cases than controls were positive for S. pneumoniae (6/15, 40% vs 2/23, 8.7%, p=0.02). M. pneumoniae was detected more commonly in school-aged children than in younger children. M. catarrhalis was detected throughout the year, whereas S. pneumoniae, H. influenzae, S. aureus and M. pneumoniae were detected more commonly in winter months (figures 4 and 5). Distribution of bacteria in the nasopharynx of children with community-acquired pneumonia (case group), by seasons, Perth, Western Australia, May 2015–October 2017. Distribution of bacteria in the nasopharynx of healthy children (control group), by seasons, Perth, Western Australia, May 2015–October 2017. We estimated that detectable respiratory viruses are responsible for 44.4% (95 % CI: 33.8% to 53.3%) of all childhood pneumonia in Western Australia (table 2). RSV contributed nearly half of this burden (20.2%, 95% CI: 14.6% to 25.5%) with HMPV contributing 9.8% (95% CI: 5.6% to 13.7%), influenza 6.2% (95% CI: 2.5% to 9.7%) and adenovirus 4.0% (95% CI: 1.1% to 7.1%). The only detectable bacteria that could be shown to make a significant contribution to childhood pneumonia in our population was M. pneumoniae (7.2%, 95% CI: 3.5% to 10.8%). We were not sufficiently powered to estimate age group-specific PAF for these pathogens. Respiratory viruses appear to contribute significantly to childhood pneumonia in Western Australia. By prospectively enrolling and testing children hospitalised with radiologically confirmed pneumonia and contemporaneous healthy children, we were able to assess the contribution of common respiratory viruses and bacteria to pneumonia adjusting for the background prevalence of detection in children without pneumonia. We estimate that detectable respiratory viruses contribute approximately 44% of all childhood pneumonia requiring hospitalisation. Children with pneumonia were also more likely to have influenza detected. Influenza is well documented to cause severe and occasionally fatal respiratory infection.34 All influenza-positive cases and controls were unvaccinated. Low influenza vaccination has been reported among children with influenza-confirmed pneumonia previously.35 Consistent with a protective effect, improved uptake of seasonal influenza vaccine in children is likely to reduce hospitalisations for pneumonia. RV was detected in similar proportions of children with (15%) and without (21%) pneumonia. Previous studies also detected RV in both children with pneumonia9 11 27 28 as well as in apparently asymptomatic children.14 36 The latter raises doubt about the contribution of RV in pneumonia.37Our finding is in line with other case–control studies that also failed to show the significant contribution of RV in acute respiratory infections in children.9 11 38 While RV, particularly RV-C, has been associated with childhood wheezing and asthma,39 its role in childhood pneumonia is not established. We had insufficient numbers to determine any specific RV types to be more prevalent among cases than controls; a study among Burundian children with lower respiratory tract symptoms associated RV-A with pneumonia and RV-C with wheezing.40 However, recently, using advanced molecular techniques such as transcriptomic analysis, a robust immune response had been measured in symptomatic children with detectable RV, substantially higher than in asymptomatic RV-positive children,41 suggesting the role of RV in acute respiratory infection needs more exploration. A major strength of our study was the contemporaneous enrolment of children without pneumonia who were frequency-matched by age to pneumonia cases throughout the study period, which addressed methodological limitations in previous case–control studies in developed settings during post pneumococcal vaccination era.9 11 However, our study has some limitations. To detect respiratory viruses and bacteria, we collected biological specimens from the upper respiratory tract (nasopharynx). The diagnosis of probable infectious agents associated with the lower respiratory tract illness such as pneumonia in children is often based on minimally invasive nasopharyngeal aspirates or nose/throat swabs.9 46 Testing of specimens from usually sterile sites (including blood and pleural fluid for culture or PCR) is available in our setting but was not mandated by our protocol. It is to be noted that while detecting a pathogen in the upper respiratory tract is not conclusive of its causal association with disease; however, testing control children without pneumonia enabled us to have a better estimation on contribution to pneumonia at the population level. Our ability to identify respiratory pathogens associated with pneumonia was limited by the sensitivity of testing the specimens from nasopharynx for infection in the lower airways. Differences between pathogen detection in the upper and lower tract have been shown previously47; it is plausible that in some cases with detectable virus, shedding of virus from the nasopharynx might be insignificant, or that shedding might be waning by the time children are hospitalised with pneumonia. Because of the sensitivity of our testing methods is likely incomplete, we expect that these estimates of the contribution of viruses to pneumonia represent minimum estimates. We used qualitative PCR assays in this study; determination of pathogen density through quantitative assays may permit distinction of causative from coincidental infection in particular cases of pneumonia.48 We did not collect but data on radiographic details, for example, lobar consolidation or intestinal infiltrate, of enrolled cases would be useful to assess if radiographic pattern is associated with pathogen (bacterial or viral or both) detected in nasopharynx. This is the most comprehensive study that described contribution of respiratory pathogens to childhood pneumonia in Australia to date and one of few case–control studies on childhood pneumonia from high-income settings in the PCV era. We found that respiratory viruses are a major contributor to childhood pneumonia. RSV appeared to account for a substantial proportion of viral pneumonia and should continue to be a focus for the development of preventative and treatment strategies. The burden of HMPV pneumonia may have been underappreciated before now. Data from this study could serve as baseline characteristics to assess the effectiveness of viral vaccines after their availability. Future studies should aim to develop a precise diagnostic tool that reliably distinguish viral from bacterial pneumonia to allow for targeted antiviral therapies and the more judicious use of antibiotics in treating childhood pneumonia. The authors thank all the study participants and their parents for their participation in this study. The authors also thank nurses and physicians of the Emergency and General Paediatrics Departments and outpatient clinics of Princess Margaret Hospital for Children, staff of the local immunisation clinic, Perth, Western Australia, for helping in study participant recruitment. The authors also thank all nurses and research assistants of Vaccine Trial Group, Telethon Kids Institute who recruited study participants, and collected and processed study samples. Telethon Kids Institute acknowledges Aboriginal and Torres Strait Islander people as the Traditional Custodians of the land and waters of Australia. We also acknowledge the Nyoongar Wadjuk, Yawuru, Kariyarra and Kaurna Elders, their people and their land on which the Institute is located and seek their wisdom in our work to improve the health and development of all children.
. Declines in pneumonia hospitalizations of children aged <2 years associated with the use of pneumococcal conjugate vaccines - Tennessee, 1998-2012. MMWR Morb Mortal Wkly Rep 2014;63:995–8. Australian Bureau of Statistics, 2018. Australian demographic statistics, September 2017 http://www.abs.gov.au/Population (cited 5 Apr 2018). National Centre For Immunisation Research & Surveillance, 2016. Annual immunisation coverage report 2016 http://www.ncirs.edu.au/assets/surveillance/coverage/NCIRS-Annual-Immunisation-Coverage-Report-2016.pdf (cited 2 Apr 2018). Contributors MUB: Participant enrolment, data collection, specimen collection, data analysis, first draft manuscript and subsequent versions. TLS: Conceive the study, supervise data collection, supervise data analysis, critical review of manuscript. RW: Participant enrolment, data collection, specimen collection, critical review of manuscript. JL: Laboratory testing, critical review of manuscript. TR: Laboratory testing, critical review of manuscript. CG: Laboratory testing, critical review of manuscript. CdG: Laboratory testing, critical review of manuscript. MLB: Conceive the study, support data collection, critical review of manuscript. RBT: Supervise laboratory testing, interpret laboratory finding, critical review of manuscript. L-ASK: Supervise laboratory testing, interpret laboratory finding, critical review of manuscript. CS: Laboratory testing, critical review of manuscript. ACM: Conceive the study, support data collection, critical review of manuscript. PCR: Conceive the study, critical review of manuscript. DWS: Conceive the study, supervise laboratory testing, interpret laboratory finding, critical review of manuscript. AJ: Conceive the study, critical review of manuscript. CCB: Conceive the study, supervise data collection, interpret laboratory analysis, supervise data analysis, critical review of manuscript. Funding Funding for the study has been provided by the Telethon-Perth Children’s Hospital Research Fund, Perth Children’s Hospital Foundation and Telethon Kids Institute. TLS and CCB are supported by NHMRC Career Development Fellowships. Competing interests PCR receives grants from GlaxoSmithKline, Novavax, Medimmune and Janssen outside the submitted work; L-ASK has a patent WO2005108580A1 licensed to Pfizer. Patient consent Written informed consent was obtained from parents/legal guardians of all study participants. Ethics approval The protocol was approved by Human Research Ethics Committee of the Princess Margaret Hospital (PMH HREC REF 2014117EP). What causes pneumonia in children who have had their jabs?